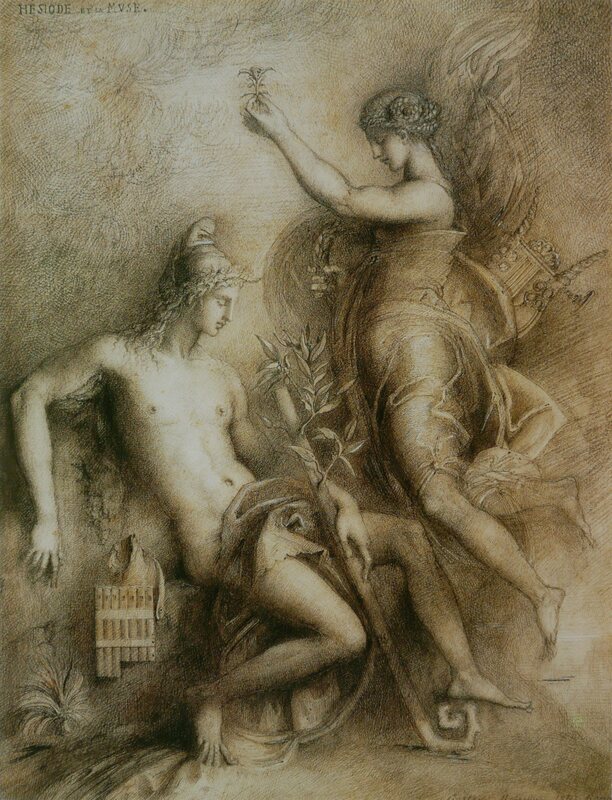 Great poets and sages, bards and artists, if they be wise, dedicate their art to their Muse; and many, in times past, have professed to be the ‘son of’ (hence the recension within faerie lore to d’arte), often claiming an ethereal bonding, as devotees to their beloved Muse. Rather than Mothers, they are better known as virginal nymphs. Eventually, these divine ladies became the nine ‘Mothers’ of Apollo, whose prophetic qualities inspired the Pythia at Delphi. On Mount Helicon, they formed the mantic companions of Dionysus. Grand statuary adorned the Temples of the Mouseia, and their followers, known as Thespians celebrated a solemn festival of the Muses on Mount Helicon and Mount Parnassus, even within the Academy in Athens. Spartan warriors offered sacrifices to these great spirits sacrifices previous to battle. Yet another Cult revered their influences in the dream world of Hypnos. 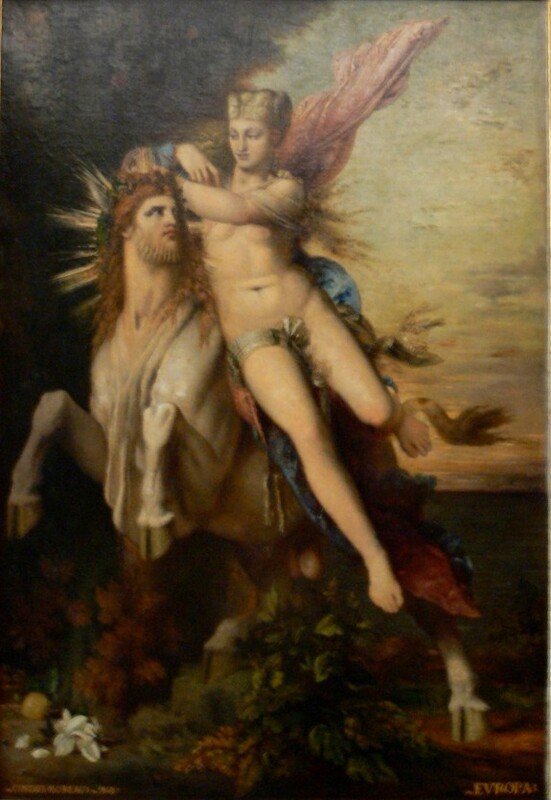 Homer similarly flavours his great epic with exploits of the graceful Artemis, here at play with the Kharites. It is therefore quite remarkable that Plutarch (l. c.), in contradistinction, records the stoic tradition that persisted, which regarded the Nine Muses especially as the Mneiae, or ‘Remembrances.’ But this may be due to their association with the mourning of the dead in elaborate funereal dances of lamentation and dirge. They were frequently referred to as ‘Judges’ too in this capacity. Certainly, the power most commonly assigned to them is of inspirational insights for poet and choreographer alike. Homer cites the presence of the Nereides, the nine daughters of Nereus, in his Odyssey, the grand funeral of the mighty hero Achilles, equating them with the Mousai. Hubris before the gods, was met swiftly and assuredly with divine retribution, deformity and blindness spiting those whose vanity breeched the mark. The bird-like Sirens lost their striking plumage to the Muses after losing a contest for their beautiful song who thereafter wore them as bright decoration, others were yet transformed from mortal (the nine daughters of Pierus) to bird. ‘Of course it was a shame to strive with them but greater shame to yield. The choice of Nymphae was made; they took the oath by their own streams, and sat on benches shaped form living stone. Then, without drawing lots, the one who claimed to challenge sang of the great war in heaven, ascribing spurious prowess to the Gigantes, belittling all the exploits of the gods: how Typhoeus, issuing from earth’s lowest depths, struck terror in those heavenly hearts, and they all turned their backs and fled, until they found refuge in Aegyptus and the seven-mouthed Nilus. She told how Typhoeus Terrigena (Earthborn) even there pursued them and the gods concealed themselves in spurious shapes; “And Jupiter [Zeus] became a ram,” she said, “lord of the herd, and so today great Ammon Libys’ [Zeus-Ammon] shown with curling horns. 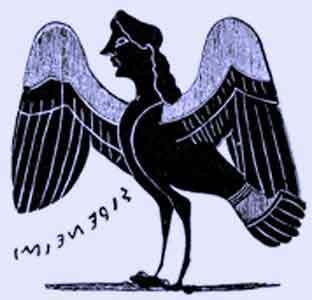 Delius [Apollon] hid as a raven, Semeleia [Dionysos] as a goat, Phoebe [Artemis] a cat, Saturnia [Hera] a snow-white cow, Venus [Aphrodite] a fish and Cyllenius [Hermes] an ibis.” So to her lyre she sang and made an end. ~ by meanderingsofthemuse on August 13, 2015.